In January 1902, with debts of £2,670 – equivalent to £260,000 in 2016 – the club was served with a winding-up order. Captain Harry Stafford found four local businessmen, including John Henry Davies (who became club president), each willing to invest £500 in return for a direct interest in running the club and who subsequently changed the name; on 24 April 1902, Manchester United was officially born. Under Ernest Mangnall, who assumed managerial duties in 1903, the team finished as Second Division runners-up in 1906 and secured promotion to the First Division, which they won in 1908 – the club's first league title. 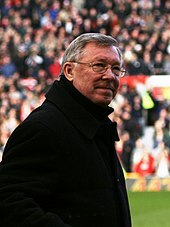 The following season began with victory in the first ever Charity Shield and ended with the club's first FA Cup title. 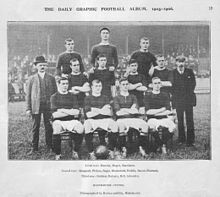 Manchester United won the First Division for the second time in 1911, but at the end of the following season, Mangnall left the club to join Manchester City. A white football player with short, dark, greying hair. 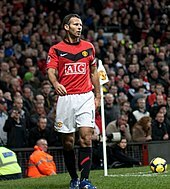 He is wearing a red shirt, white shorts, white socks and white football boots. He is running and has puffed-out cheeks.